Breaking Glass News!! 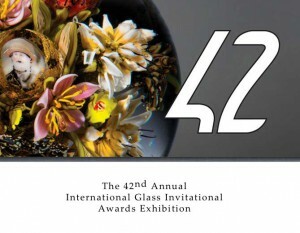 Tim Tate to be Featured Artist at GLASSTRESS During Venice Biennale! Organized by Fondazione Berengo, GLASSTRESS exhibitions have been presented in prominent museums and institutions worldwide including the Boca Raton Museum of Art, Florida, the London College of Fashion and The Wallace Collection in London, the Art Museum Riga Bourse in Riga, Millesgården Museum in Stockholm, the Museum of Arts and Design (MAD) in New York, the Beirut Exhibition Center (BEC) in Beirut, and the Ptuj City Gallery in Ptuj, Slovenia. Click HERE to jump to website. 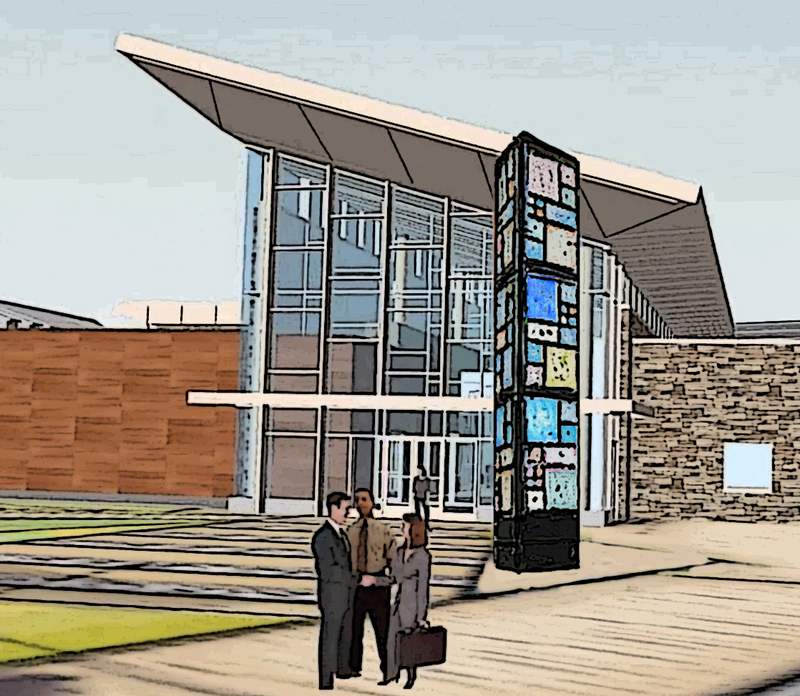 Washington Glass Studio sculpture at the new Laurel Library. Photo by Pete Duvall. 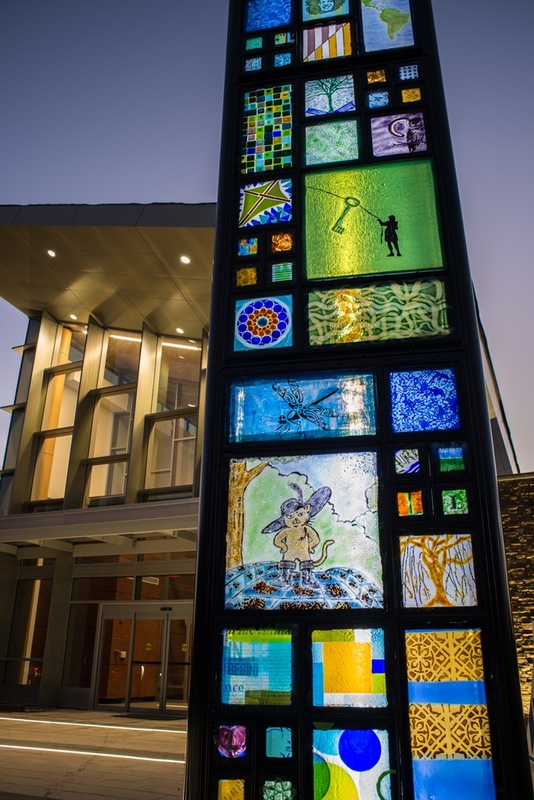 The Washington Glass Studio (WGS) has recently completed installation of a community based site specific public art commission for Prince George’s County Laurel Library. The new building was designed by Grimm + Parker Architects, with the grand opening of the new library scheduled for November 28, 2016. Features of the spectacular new library include an inset floor area in the children’s section where kids will get to peer at a replica velociraptor skeleton through the glass floor. Just a few miles away from the library site is Dinosaur Park, where scientists work to excavate fossils from the early Cretaceous period. Dinosaur imagery was also included as a theme running through the glass artwork panels. 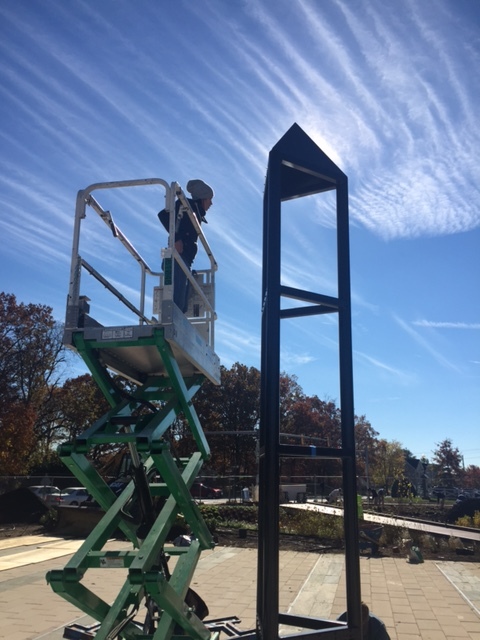 WGS was awarded the commission to make the outdoor sculpture at the front of the new library by Maryland’s Prince George’s Arts and Humanities Council (PGAHC). 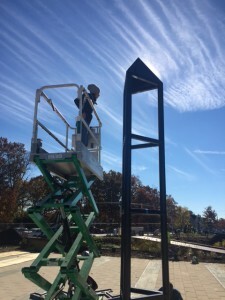 The Art in Public Places Program RFQ sought out artwork that would provide world class artwork for Prince George’’s County residents and visitors. 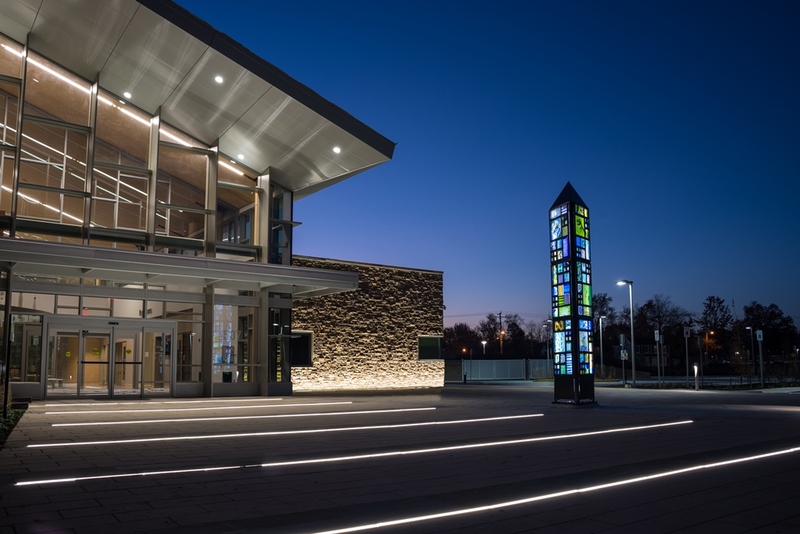 WGS proposal for the project was a 17′H internally illuminated glass and steel sculpture that incorporates glass panels made by the community,residents and stakeholders of the Laurel, MD community. 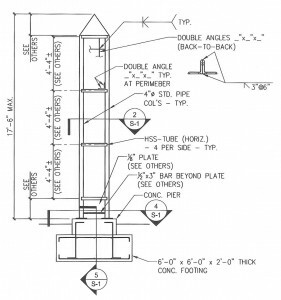 The engineering of the steel framework involved detailed analysis of the structure and its components. WGS worked with structural engineer Holbert Apple to ensure the integrity of the design. 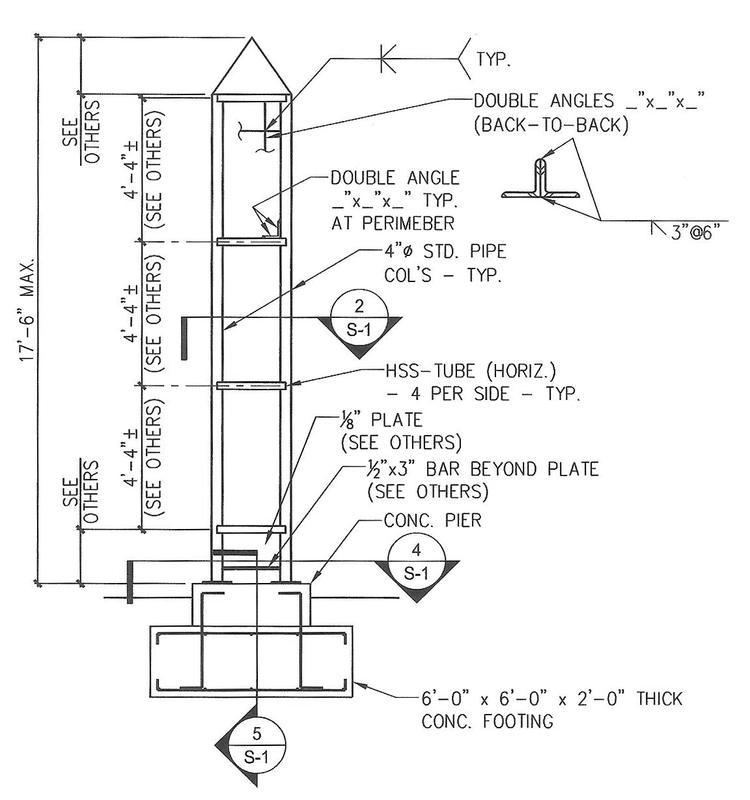 Detailed analysis of sculpture was part of the design development process. 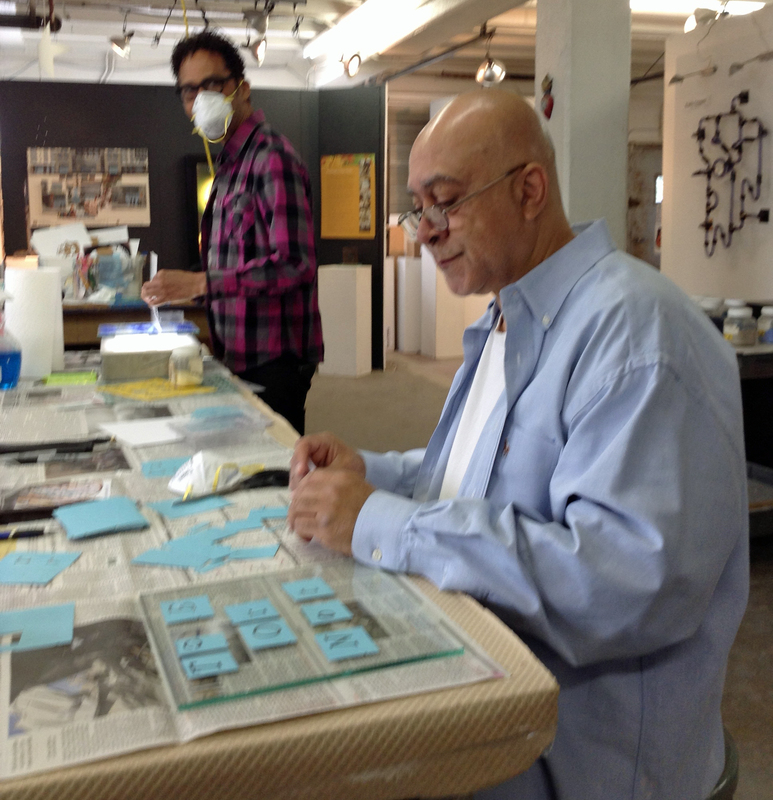 Over 100 glass inset panels were made during the series of workshops held at the Washington Glass School. The Baltimore Sun newspaper featured a story by reporter Lisa Philip about the process. The artwork’s title “Involve Me and I Learn” is based on a phrase attributed to US Founding Father Benjamin Franklin (who also opened the first US public library). The name references the engagement of the community. 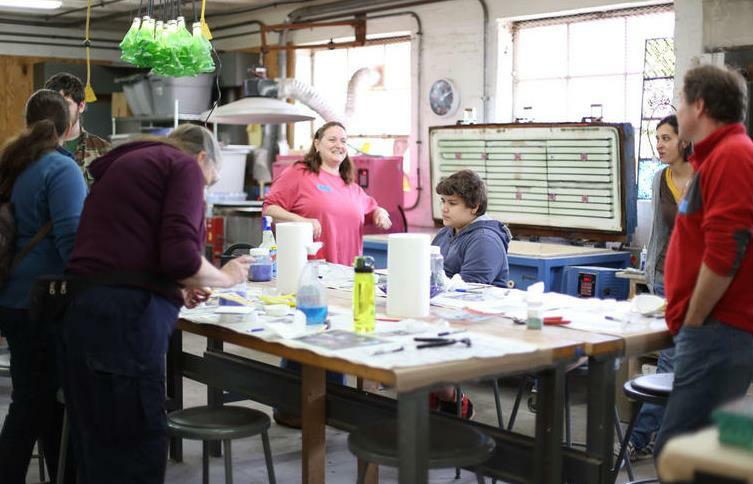 The neighborhood and the Laurel Library supporters had joined in making the individual glass panels in workshops at the Washington Glass School. 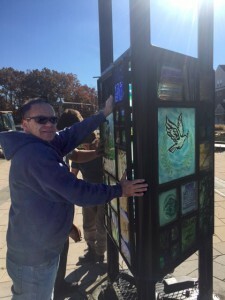 The resulting variations in each tile’s imagery and technique embody the artist’s concept in bringing the people from the diverse community together to create a cohesive and vibrant sculpture. Design Team: Laurie Brown, Michael Janis, Tim Tate, Erwin Timmers, Audrey Wilson. With Josh Hershman and Pierre Browning. Grand Opening / Dedication – 10:30 AM, Monday, November 28, 2016 – All are invited! 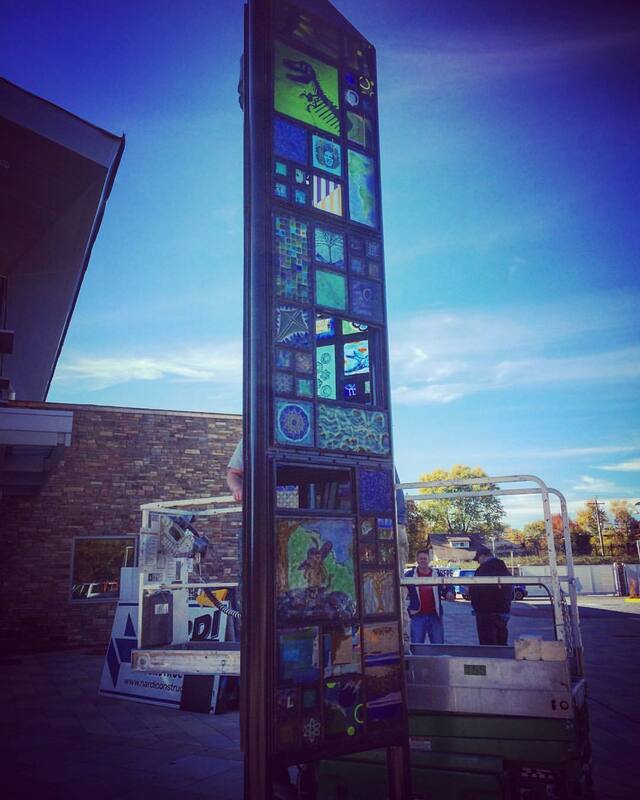 Washington Glass Studio installed their outdoor sculpture at the new Laurel, Maryland library. The 16′ H tower titled “Involve Me and I Learn” has over 100 glass tiles mounted in the steel framework. 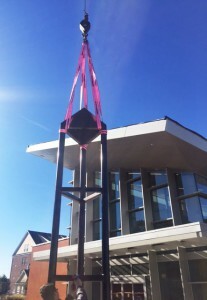 The artwork’s title – attributed to Ben Franklin – references the engagement of the community. 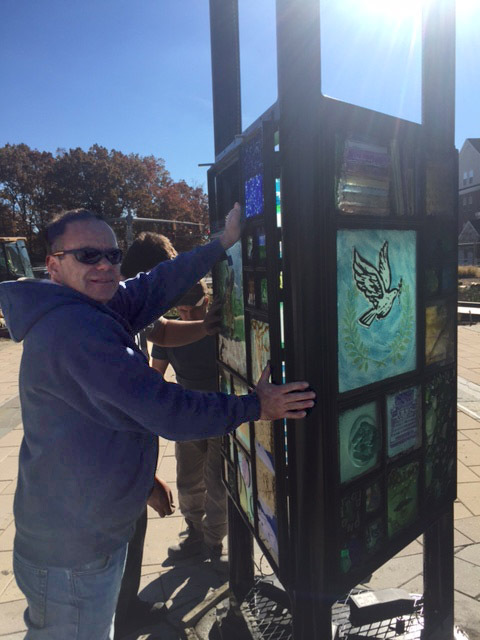 The neighborhood and the Laurel Library supporters had joined in making the individual glass panels in workshops at the Washington Glass School. The Baltimore Sun had earlier in the year covered the story of the glass quilting bee workshops. 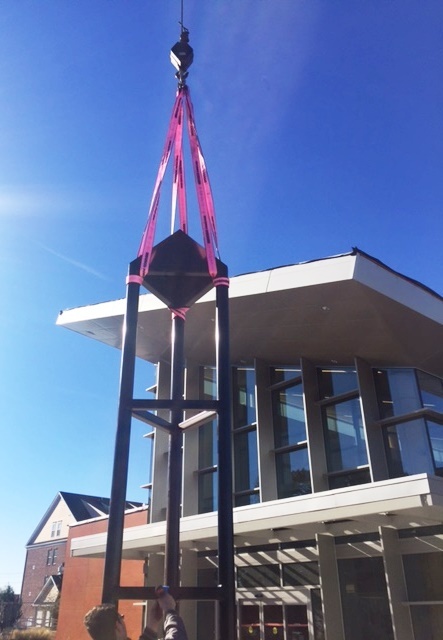 Siteworks for the sculptural and architectural application of glass were completed and the risky business of installing the works just took place. Audrey Wilson rises to meet the challenge. Washington Glass Studio Co-Director Erwin Timmers bolts the steel framed glass panels to the main structure. The panels were fitted and bolted in place and the internal LED lighting was installed. Prince George’s Art in Public Places has advised that the official opening of the stunning library is set for November 28th. Artist Tim Tate has been pulling traditional craft into new realms and depths. Tim shared his newest series “Witnesses of Wonders” and the work is incredible. 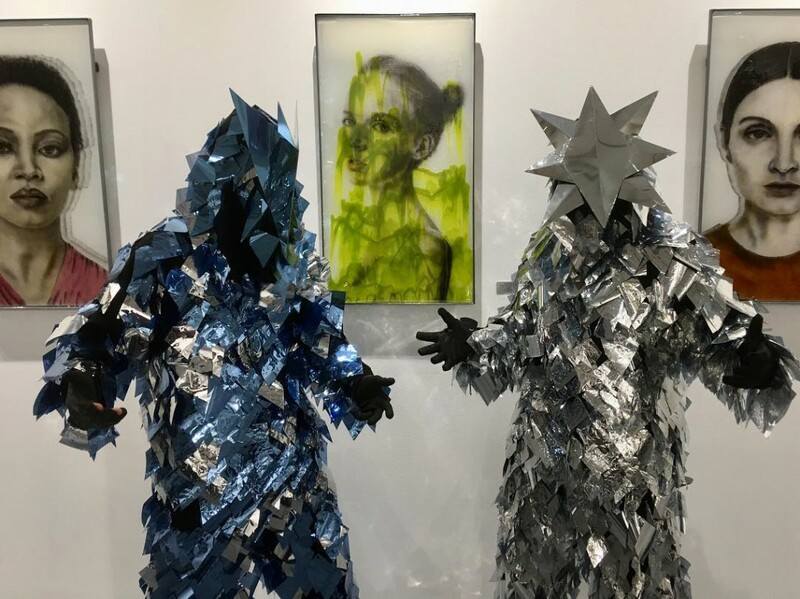 In this series,Tim has been using elements that were 3-D printed at Catholic University’s modeling department combined with infinity mirrors to expand the sensation of unlimited space in the artwork. 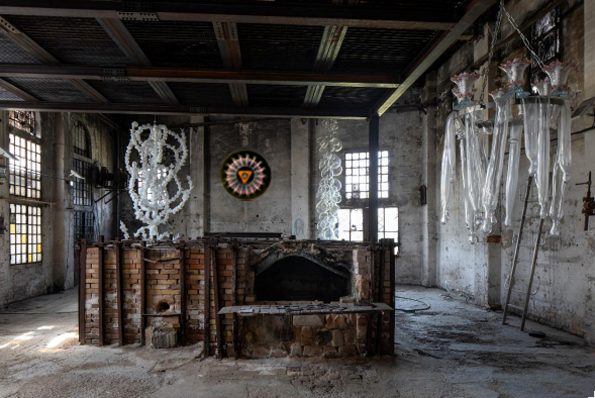 Tim Tate, “21st Century Guernica”; Glass, Cast Images, LED; 36″ x 36 x 4″. In this piece a ring of translucent refugee boats float in the center, all with no where to turn to. The center ring is shared with red poppies, the symbol for war remembrance in England. The outer edge is made up of individual images from the powerful Picasso painting entitled Guernica. 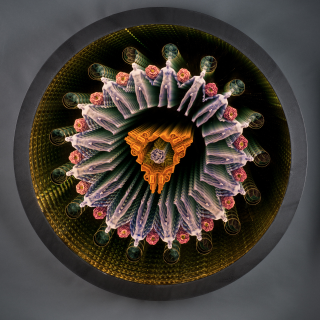 “I try to entice the viewer to look deeply into and completely experience my windows into alternative dimensions. My works create an optical and bodily illusion of infinity through apparently limitless space. There is an intimacy created by viewing deeply into a circular opening, as if peering through a portal to witness another endlessly repeating reality. The constant repetition of imagery also speaks to us of timelines: ones that go endlessly into the future or extend endlessly into the past. These repetitions reference society mired into static social patterns, some good, some bad. Tim Tate. “21st Century Guernica” detail. “Picasso made his painting in mostly tones of black white and gray “to drain the life out of them”. I drenched them in red and returned color to them because this horror is happening right now in this world….in fact this very second.” said Tim Tate. We look inside these portals as if seeing into a dream, fully realizing that this is but an illusion. But even though we know it is a illusion that should not stop us from freely examining it, and hopefully seeing another world at the same time. Uncomfortable with any single defining time, I prefer sliding through the centuries; from 19th century Victorian techno-fetishism, to mid and late 20th century references to endless mirrors and studio glass to 21st century electronics and political focus. Perhaps all my work can be defined by how uncomfortable I am with definitions.” Tim Tate. Habatat Galleries was established in 1971 in a suburb of Detroit, Michigan. It is the oldest and largest gallery in the United States devoted exclusively to artists working with glass as their medium. The 12,000 sq. 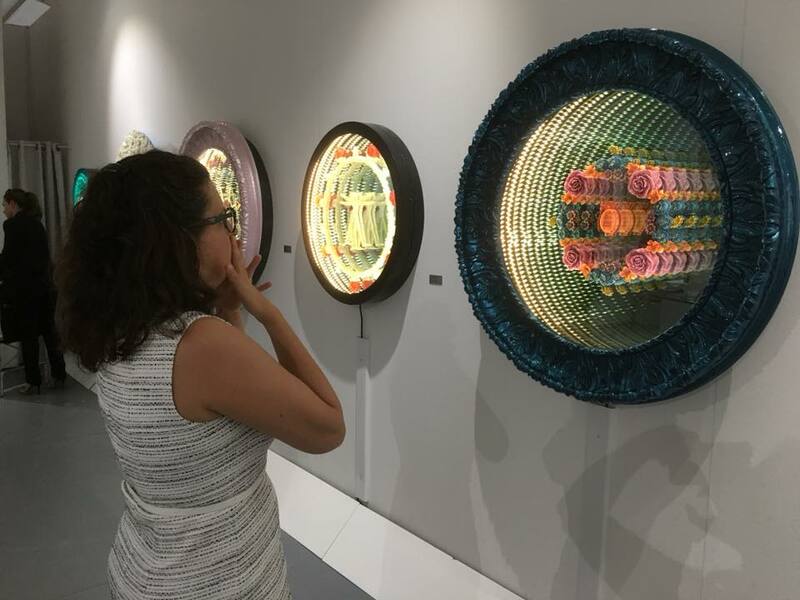 ft. gallery in Royal Oak, MI, is the home of the International Glass Invitational, which for 42 years has introduced and exhibited the greatest artists working creatively with glass. This year, three artists from the Washington Glass School – Sean Hennessey, Michael Janis and Tim Tate are included in the exhibition. 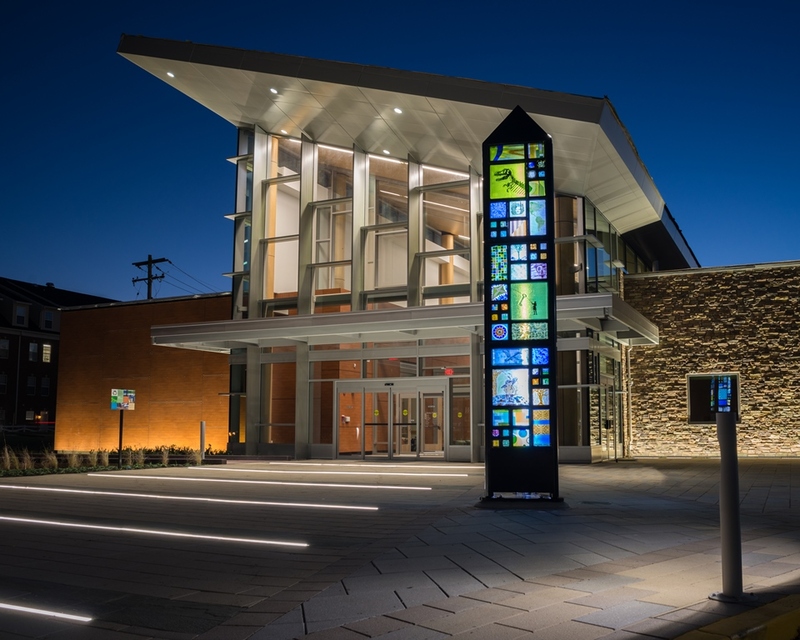 Habatat Galleries – Michigan works with many museums and art centers where they have developed exhibits that have been displayed in over 100 public institutions. Each year Habatat publishes catalogs celebrating these both national and international events. Habatat Gallery has the catalog for the 42 International Glass Invitational online – click on image to jump to online publication. 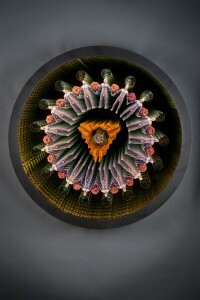 Michigan’s Habatat Galleries presents a grand opening of the oldest and largest glass exhibition in the United States. 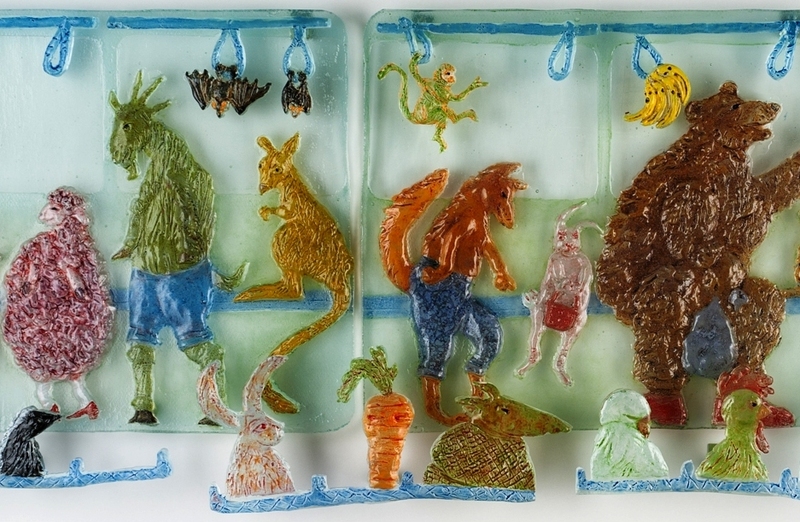 Over 400 works of contemporary glass art will be on display opening April 26th at 8:00 pm. Located in Royal Oak, Michigan at Habatat Galleries, 2014 marks the 42nd year of this monumental event. The 100 Artists who participate are from over 23 different countries. 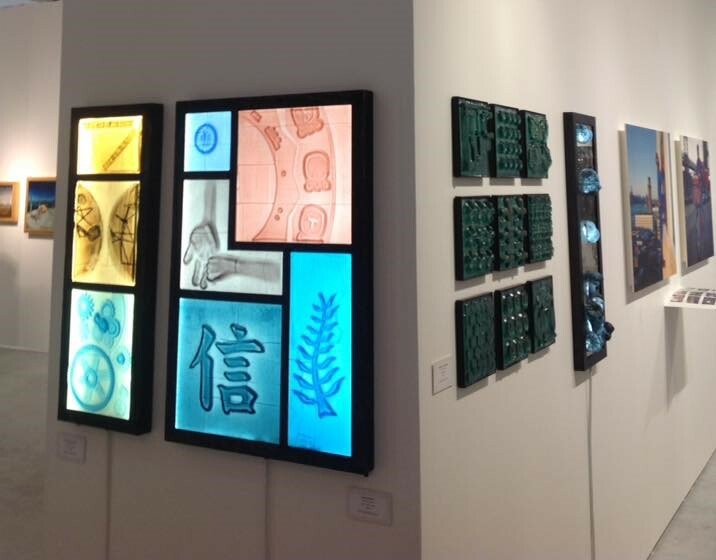 This exhibition inspired April as Michigan Glass Month which for over 25 years offers 30 or more glass events held throughout the State. Three artists from the Washington Glass School – Sean Hennessey, Michael Janis and Tim Tate – are featured in this year’s exhibit. Tim Tate writes about the tenets of “Glass Secessionism”. 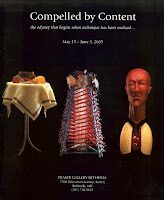 I write this article in an effort to change your thinking about contemporary glass art. In the following pages, I compare and contrast the changes that 50 years of Studio Glass have produced. My beliefs come from my focus on the artist retreat models, such as Penland, Pilchuck, Corning, Haystack, Etc. This focus was a result of not being in academia. I did not have the resources that would allow me to pursue an MFA. My energies were thrust upon those institutions that catered to working artists. These art retreats were my training ground. The evidence supporting my claims comes mostly from my own experiences and observations as a practicing sculptural glass artist, including 10 years showing only in sculptural fine art settings and then crossing over to the glass gallery world. At this point, I straddle the line between these worlds. Half the galleries that represent my work are glass galleries, half are fineart galleries. My premise is that to succeed in glass in the 21stcentury, we have to secede from 20th Century founded Studio Glass. The Studio Glass model was firmly in place. It was time to integrate into the Fine Art World. What we needed was a bridge between these two worlds, to assist in this transition which was coming so very quickly. “Glass Secessionism” is firmly rooted in the historical precedent of Photo Secession, and that movement provides a template for organizing our nascent movement. Like the Photo Secession, we are moving away from the technique-dominated culture of studio glass. We respect good technique, and understand its importance in creating great art from glass. However, we believe that great art should be driven primarily by artistic vision, and technique should facilitate the vision. For too long, technique has driven the majority of studio glass. As Secessionists we do not seek to isolate ourselves from other artists working in glass, but to enhance the field as a whole. “Glass Secessionism”, a Facebook page, was created to be an accessible venue for the showing, discussion and definition of secessionist works. Works that are based in mixed media and time base electronics for example. Its objective is to advance glass as applied to sculptural expression; to draw together those glass artists practicing or otherwise interested in the arts, and to discuss specific examples of the Glass-Secession or other narrative work. As I’ve said, this movement is modeled after Alfred Stieglitz and the Photo-Secessionists and how they redefined photography. Though they may seem incomparable, there are distinct similarities between Photo-secessionism and Glass Secessionism. Both mediums emerged from the lab/factory with high technical barriers inherent in the materials. We applauded the genius required to make something from the chemistry/fire/darkrooms/furnaces/ environment, and some of the early pioneers had a vested interest in keeping secrets and making adaptation by artists difficult. Both mediums were born of science and industry, and both had similar paths of evolution as a result. 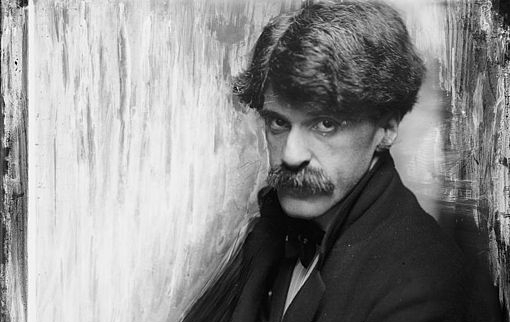 In 1902 Stieglitz announced the existence of a new organization called the Photo-Secession, a group dedicated to promoting photography as an art form. The name of the group suggested that it was designed to break away from stodgy and conventional ideas. In many ways, I agree with Stieglitz’s deeply critical view of what he understood to be the rampant conventionality, conformity, and institutionalization of the photography field in the early 20th century. It was said that Steigletz wanted to secede from “artwork that had gone stale through the copying of Victorian, conventional styles, but more importantly from the dictatorship of the entrenched institutions, galleries, art schools and professional art organizations that enforced or at very least sanctioned copying or imitation.” In my perhaps isolated world this seemed to hold great similarity to what I saw happening in glass in the beginning of the 21stcentury. I saw it, but those artists still involved heavily in that aesthetic seemed not to. The modern history of glass is unfolding before our eyes. Before glass became more accessible in this country, you usually had to work in a glass production factory to have contact with glass. Slowly, in the 60′s and 70′s, schools and individuals started to proliferate and glass began to emerge to a larger population to experiment with. In those early days, American glass artists seemed to have an insecurity regarding our place in the glass world, so there was a huge focus on Venetian blowing techniques. This focus was perhaps more in the artists retreats than MFA programs, which produced many exceptions. RISD seemed to lead the way in idea driven glass, but most people did not learn glass from the MFA programs. Glass Secessionism seems to be driven not just by MFA programs but from younger artists looking for a voice of their own, not connected to a distinct glass history. 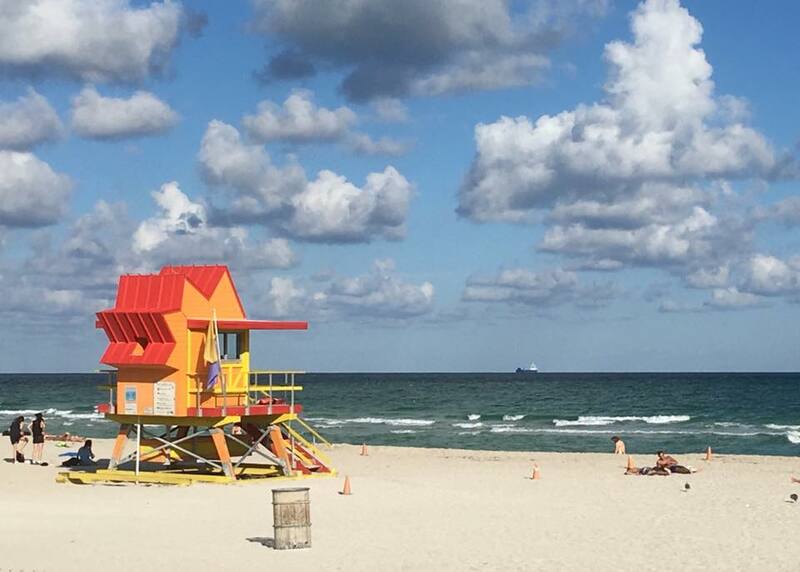 I believe most learned in small studios and artists retreats, just as I did. As more people got exposed to glass, things began to progress. By the 80′s and the early 90′s we not only became as good in technique as the Venetians, it seemed we frequently surpassed them. There were some amazing stand-out artists who had mastered technique, then took that technique and developed compelling narrative sculptural work. There were far more who focused on perfecting that technique in the Venetian tradition and focused primarily on vessels and the indirect narrative implied within the material. This is a viable and valuable path, if that was your interest and hot glass was readily available to you. The closest hot glass available outside of academia to me was Penland School of Crafts. Accordingly, during this same time period, schools like Pilchuck and Penland mostly focused on teaching hot glass classes and techniques, as it is much less concrete to teach ideas. However, many began to push the reigning concepts and methods further. In many MFA programs the insecurity of exploration was gone, replaced by a desire to take glass further—to not be the second best goblet maker, as so many had in the previous period of Venetian technical hegemony. 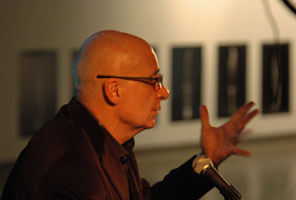 Garth Clark at the 2008 lecture. The person who made the most sense to me was Garth Clark. In his now infamous 2008 lecture at the Portland Museum of Contemporary Craft, he finally voiced what I had felt for sometime: that the arts and craft movement, having reigned for 150 years, died forever in the mid 1990′s. It died of “art envy.” No one wanted to be a craftsman anymore…everyone wanted to be an artist.Add to this the fact that in the 1990′s collectors and galleries remained tied to a type, price point, and aesthetic. Catalog of “Compelled by Content” exhibition. By 2005, there was a small but intellectually and aesthetically exciting group of artists producing narrative work, many of it showcased in a show I curated entitled, “Compelled by Content.” This conceptually derived focus seems to be a central part of what I term “Glass Secessionism.” I define this as ideas and concepts that exist autonomously from their own materiality. There were a few magnificent examples of newer artists using narrative. (narrative artists such as Christina Bothwell, Michael Rogers, Carmen Lozar, De La Torre Brothers, Susan Taylor Glasgow, etc). These were the types of artists I looked up to. Even within artist retreat venues, these artists were a minority and rare. But at least I felt there were others like me. 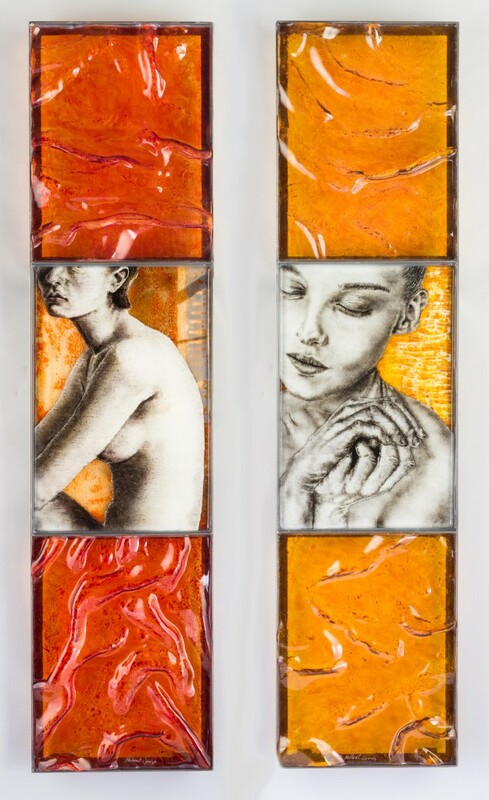 Glass artists began to move out of their disciplinary confines and began draw from multiple media and disciplines. One group that also seceded was the Hyperopia Projects. They summed this movement up by writing that, “…we do not fit comfortably into glass, sculpture or new media, but draw from allof them. Our interests and practices are between disciplines and media. We seek to support a longer view of where glass is headed—where the identity of glass may be intermingled with the larger world of contemporary art.Our efforts are also a direct call to action for our peers to continue paving this path—dissolving and redrawing our boundaries along the way”. Many artists around the country were coming to this same realization. There had certainly been other attempts to find a model out of Studio Glass. By the 21st century, warm glass and kiln forming had found its following. Formerly frequently dismissed as the art form of non-serious hobbyists, many great narrative sculptors were emerging. These days in MFA programs around the country, you are unlikely to find a technique driven glass artist…..if you can even find anyone who still calls themselves a glass artist. 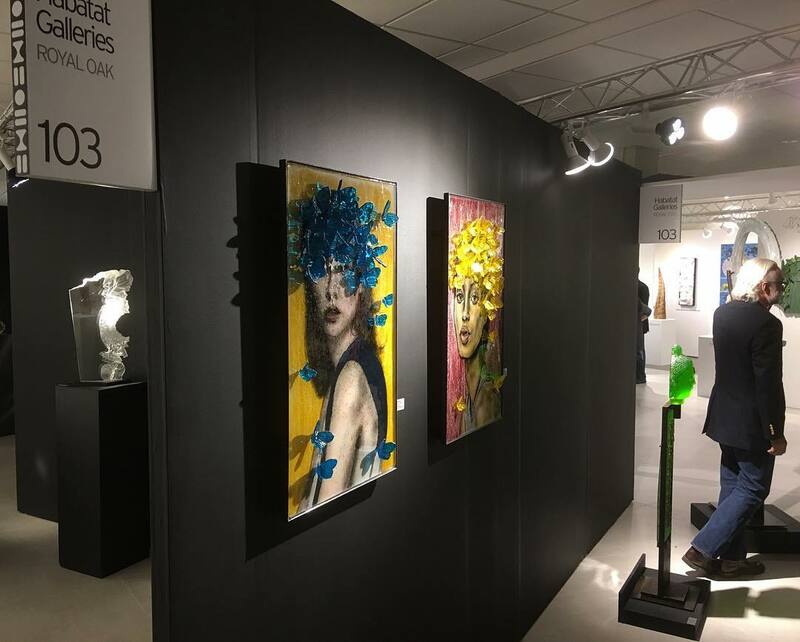 Mixed media, conceptual and performance dominate those artists, and also dominate many private schools such as ours….and certainly other private artists as well. 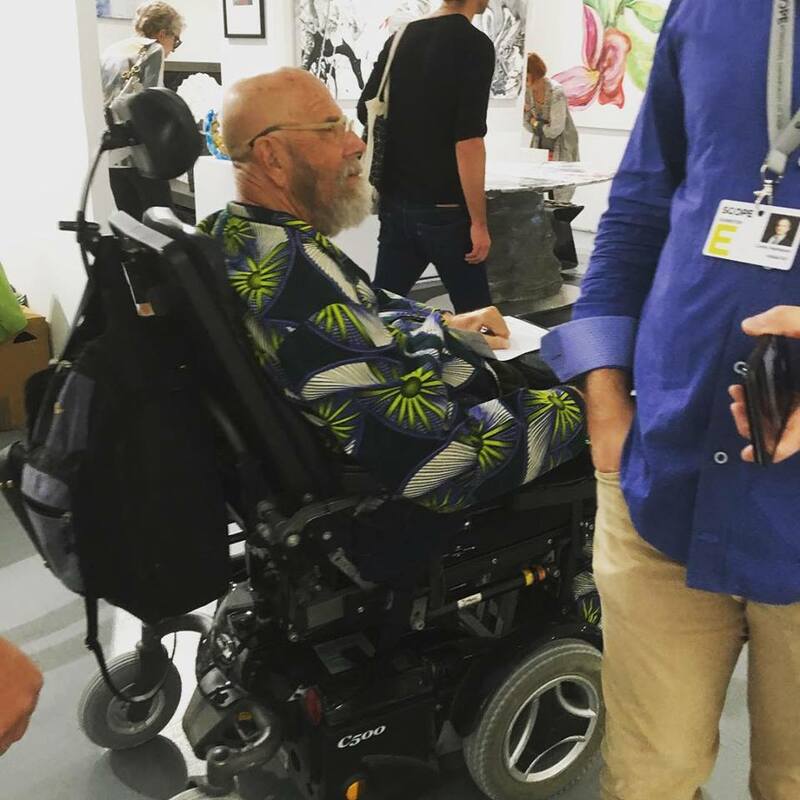 The problems began when I tried to exhibit work, and it wasn’t just glass galleries. I would knock on doors of fine art galleries and museums at the time, to show them my work. They all said similar things. The work is great, but its glass. The Smithsonian Hirshhorn Museum even had a curator that had a “no glass” policy. They would continually send me back to the glass galleries, who would say “You can have the most spectacular work of glass ever made, but if you don’t have a reputation, my collectors won’t buy it.” (an actual quote). I was caught in a difficult place, as many 21stglass sculptors were. Fine art galleries were frequently not showing glass; and glass galleries were frequently not showing emerging glass sculptors. What was an artist supposed to do? 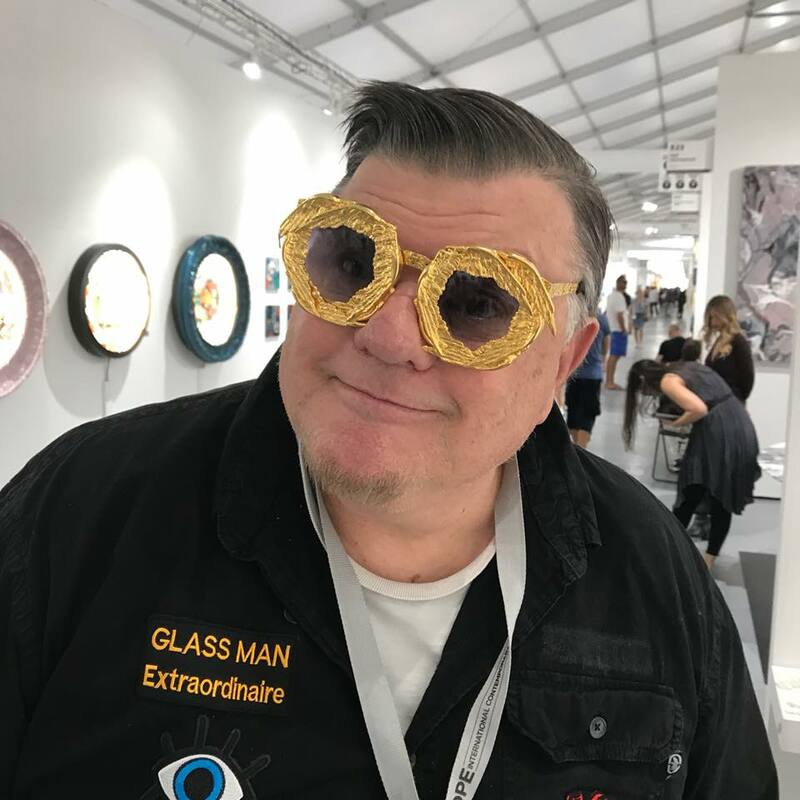 When I mentioned my frustration to Paul Parkman, a noted glass enthusiast and founder of many glass organizations, he said, “Well… if they are not noticing your work, do something they can’t ignore”. This became my mantra. As Bill T Jonesonce said; “Art is what is made when you push back.” The artists who originally founded Studio Glass pushed back in their time. Now it was my turn. 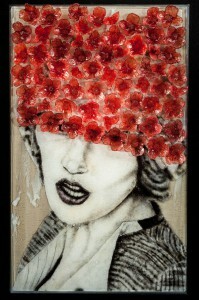 I believed that for glass to be taken seriously in the broader fine art world, then we had to secede. Only by seceding would we succeed. If the glass world wasn’t going to recognize us, then what choice did we have? A technique driven glass world. 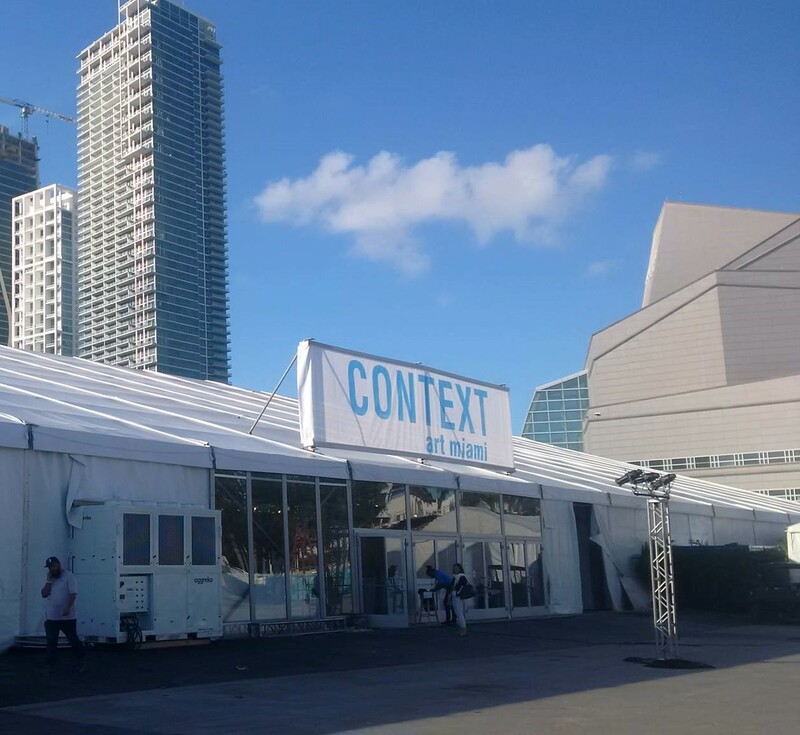 A vessel-centric dialogue. The dominance of 40 artists who began studio glass, but frequently stagnated into replication or were knocked off so frequently that it was hard to tell the knock off from the original. I was in awe of many of these magnificent artists, but also saw many great artists who received little or no recognition. The continual tedious discussion of the faulty “art vs craft” binary. To yet another magazine cover of the same glass artists again and again. (not that they didn’t deserve them…I just felt that others did as well). The predictability of who I would see inside, who would curate, show, and applaud the art. To see yet another variation of a select few artists work and their view of the world. From the way glass was discussed, thought about, collected, made, exhibited, and seen around the world. From the absence of 21st century technologies, including video, electronics, digital art and time based media and art forms . One of the major reasons I seceded was to embrace, mentor, and nurture younger artists breaking new ground. 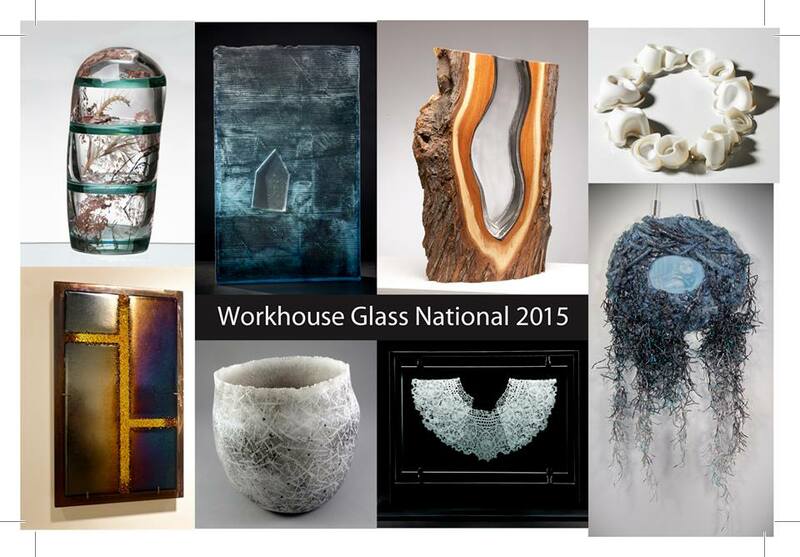 I understand this to be encouraging new directions of glass outside the traditional craft world. To embrace what I saw beginning to happen with so many younger and perhaps unrecognized artists; that they were not taken as seriously as the established artists. This has been taken as disrespect. Nothing could be further from the truth. I grew up as an artist in that glass world. I have nothing but respect and admiration for those amazing artists who founded the Studio Glass movement. We all stand upon their shoulders. In this country, collectors seemed to drive the movement. When an artist came up with a form that some people liked, the collector consciousness wanted them. An artist was frequently in a position that if they wanted to economically succeed, he or she had to replicate a particular form with subtle variations over and over. Collectors and the institutions that controlled the studio glass movement unconsciously stifled artistic exploration and creativity while also encouraging other aspects. So different from the glass artists in other countries. If the economics of Studio Glass had not taken over, I believe even the great founders would have experimented more themselves. Would Toots Zynsky have made variations of the same bowl form for so many decades? After seeing her RISD work from 40 years ago, I doubt it. I mean no disrespect towards Toots. I love her work and am just using this as an example to make what I believe to be a salient point. However, such a contention is often interpreted as disrespect. Does daring to question the established base automatically imply disrespect? It should be kept remembered that the founders of studio were certainly secessionists in their own times and in their own right. Does this mean that we no longer value Studio Glass or Post Studio Glass (work that builds on the techniques and aesthetics of 20thcentury vessels)? Not at all. There will always be a place for these wondrous objects and their makers. I am suggesting that they will not figure as prominently in the 21st century as in the 20th century. I know this makes people very angry. That is certainly not my intent. I am merely trying to map the landscape of shifts that characterize the contemporary post-modern glass world. As more shifts occur, the less likely it will be that our current Studio Glass and Post-Studio Glass frames of reference will maintain the authority they still have in the current period. By the 2000’s the preponderance of work within those venues shifted, until there was now much more secessionist type work than vessel-related or technique-driven work. This shift was perhaps led by the MFA programs, but embraced by younger artists in every setting. There you would be hard pressed to find anyone working in vessel forms or willing to call themselves a glass artist. Perhaps this new type of self-identity was the cause. A new identity began to appear—or rather, the old identity of “glass artist” began to erode. The new identity took on an anti-identity facet—it refused to be pinned down by schools or mediums or forms. I believe this is a part of the secessionist movement. What are the boundaries of Glass Secessionism? 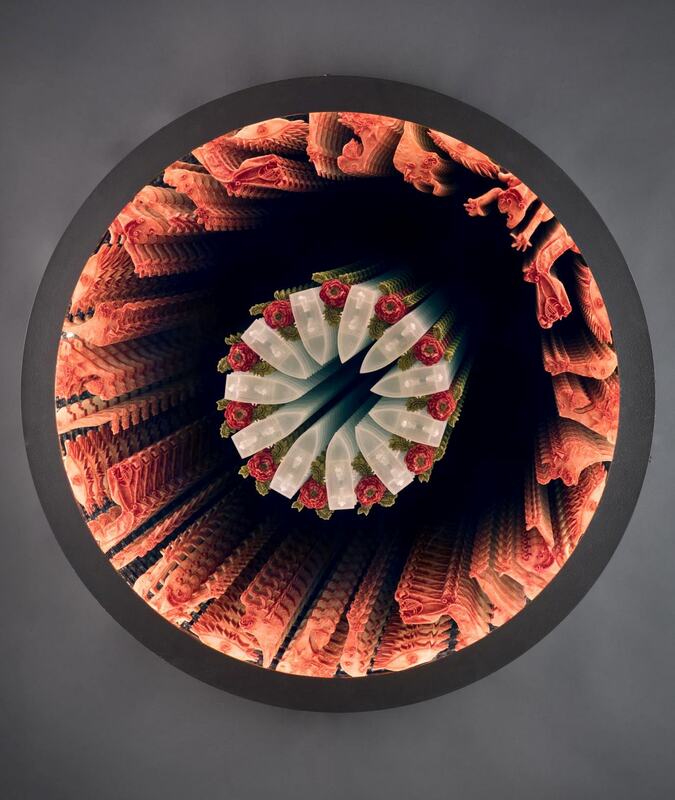 · It is not studio glass, though there were many roots and seeds of this movement found in studio glass. · Glass tends to be only one component in a mixed media sculpture. · It is not in the form of a vessel. · Time-based media involving glass will become more and more important as technology continues to progress. Time based media such as sound, video, performance. 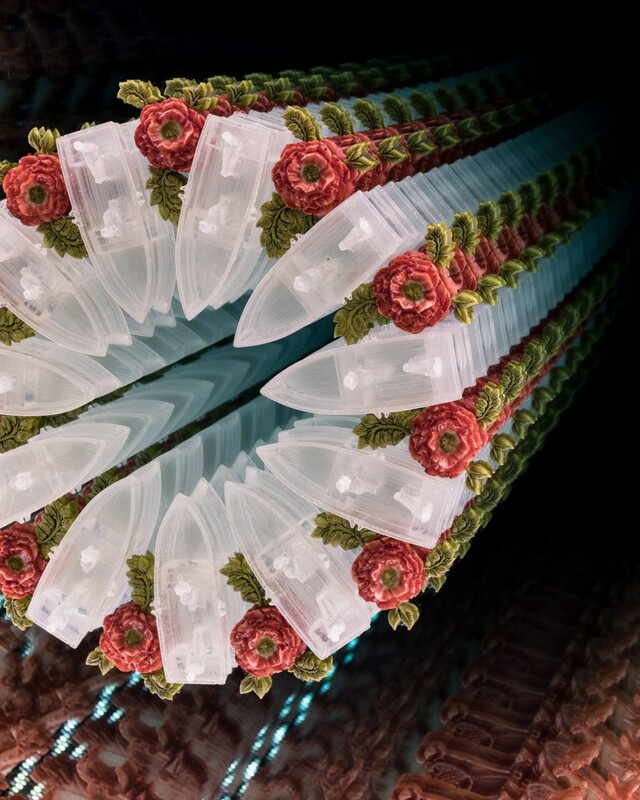 As electronics improve and become readily available, including software development, this glass art form will flourish. · Large-scale conceptual installations. These conceptual installations will also gain prominence in the museum world. The production of space—rather than the mere filling of it or accommodation to it—is a distinctive conceptual shift from the Glass Studio period. · It tends to start with an idea or concept rather than perfecting or exploring a technique. · Is not in the form of abstract expressionism. · Glass Secessionism reconfigures performance. Performance art in the Studio Glass era was about the drama of the artist making work in the studio. Performance art in the Secessionist era usually starts with an idea other than the making of an object. 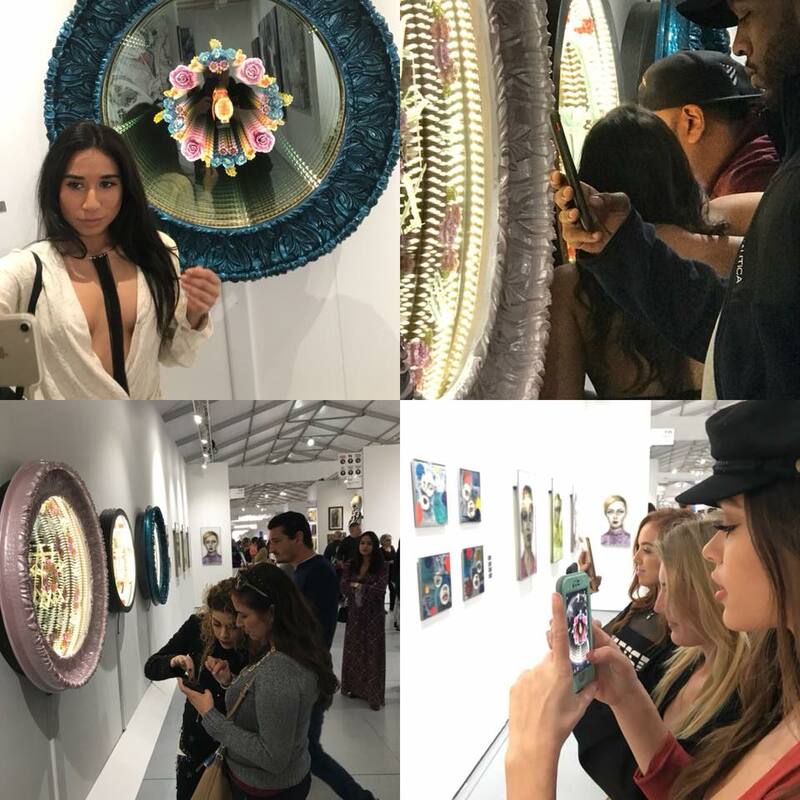 This will be one of the fastest growing areas of Glass Ssecessionism; mostly due to fact that advances in video technology and social media allows for almost instant records of performance to be shared, distributed and discussed. 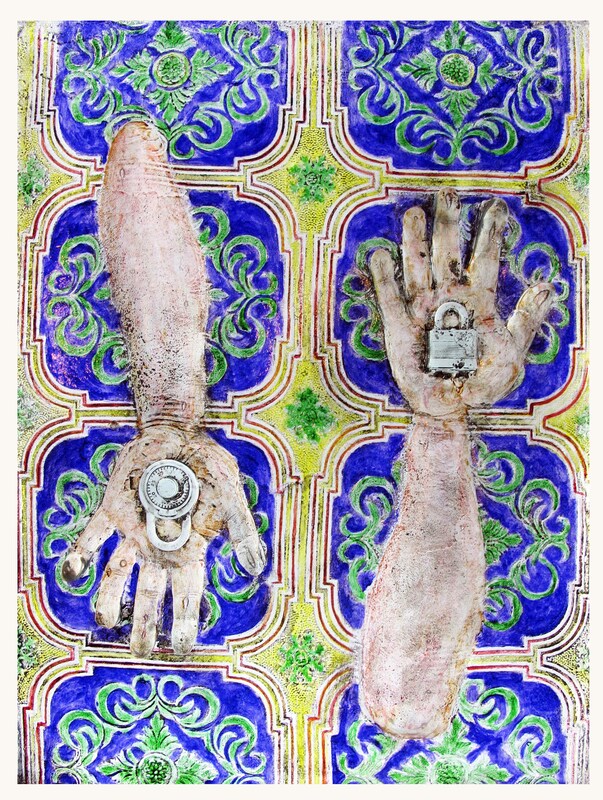 · Glass Secessionism takes place within, and often actively supports, the increasing erosion of the ownership of art, according to William Warmus on this topic. 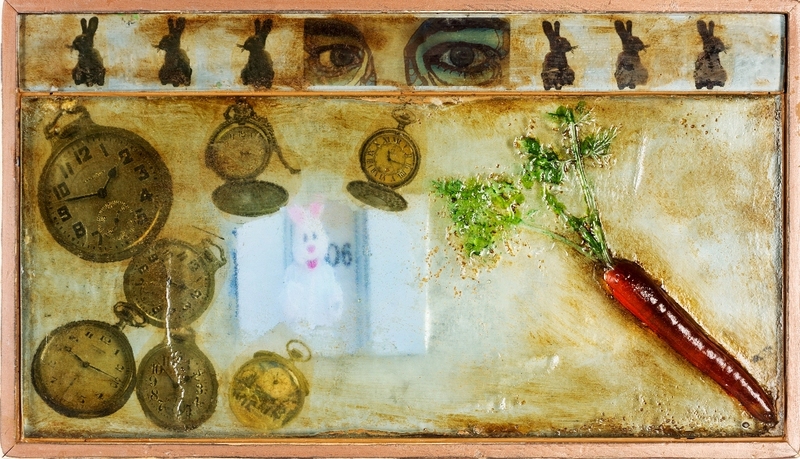 Objects were made to be exhibited and collected in the studio glass era. In the Secessionist era, while there will still be a love of well made objects, some objects will be considered the property of the collective culture. 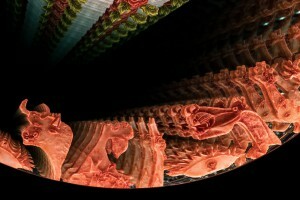 They will be reproduced digitally, shared, float around, come together as an exhibition or collection, split apart. This will challenge the artist as to how to make a living, and museums will have to reconsider the idea of ownership. This is not just in the glass world, but in the art world as a whole. This will be particularly true of performance. · Architecture is increasingly an important component of secessionism. However, the technical expertise and expert knowledge it requires will make collecting it, or even talking about it, will remain problematic and awkward. For example, most people do not know how to read floor plans. In this way, secessionism has an internal contradiction: while it becomes increasingly accessible in many other ways, it also assumes sculptural and architectural elements which require certain types of technical knowledge and skill. Another point made by William Warmus. · It tends to include a focus on narrative. I define narrative as ideas and concepts that exist autonomously from their own materiality. Where are we going? Let me suggest museum and gallery shows that would fit squarely into the 21stCentury and embrace the aesthetics of Glass Secessionism. Right now secessionist sculptors are spread over many venues, galleries and fairs. So collectors seeking this type of work are just as scattered. When a gallery of this type opens, it will crystallize this collector base as well. The gallery will become known for secessionist work and will be ground zero for collectors to check first. 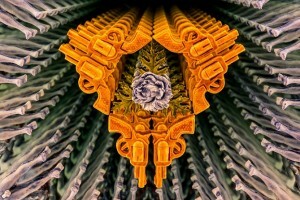 Museums will begin having secession shows. 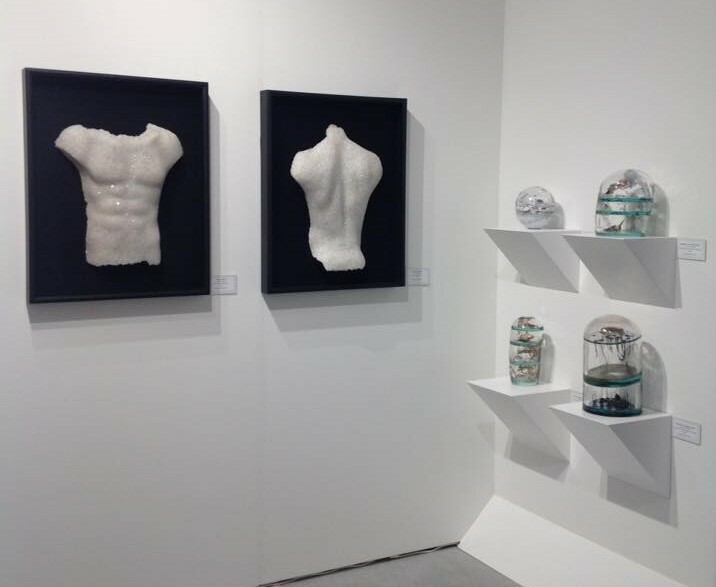 Glass will also slowly be absorbed into the fine art fairs such as the Art Basel Miami sub fairs such as Art Miami and Miami Projects. The names above will be the stars of such a movement. There are so many others ….please forgive me if I had not gotten to you. I would love to hear of other examples of Secessionist shows. With all of these thoughts in my head, I founded the Washington Glass School in 2001. The school is firmly based in the tenets of Glass Secessionism. One of the reasons so many glass artists who have graduated from this school feel that they have seceded from nothing is because I founded that school. They did not have to secede from anything because I already had. I presented the school, classes and students to the way that I saw the glass world. They frequently knew no other way. Today very few folks will stand up as self-described secessionists, partly because we are still involved in the glass world. At a deeper level, this dis-identification from any established identity is, in itself, a facet of secessionism. For me, while I certainly seceded in the 90′s to show only in fine art galleries, I was called back to the glass world in the 2000’s. I did not expect this to happen. A widely respected curator told a group of collectors that I represented the “future” of glass resulting in a prominent glass gallery owner asking to carry my work. I was completely star struck, having grown up in the glass world. To be a true secessionist I would have said “no” to both parties and stayed in my fine art world. However, I had become well placed to make the decision to become the “missing link”—to bridge both worlds simultaneously. I have done that ever since. Two significant factors in this decision were economics and ego, I freely admit. Nonetheless, my work always differed from what I perceived as the dominance of technique-driven work. These were my perceptions, based on years of my own experiences. But what else can an artist react to? I would have been a much “purer” secessionist if I also rejected the glass gallery system as well. I did not. I was still in awe of it, as I am to this day. My rebellion came in the form of what I was making and working on and a conscious distancing away from the vessels that even I had made in the past. Much of this paper was derived from comments made on the Glass Secessionism Facebook page – in particular from quotes or comments made by William Warmus, Patrick Blythe and Jennifer Scanlan. Glass Secessionism does not mark the death of Studio Glass. It makes it stronger. It enhances it as it takes prominence. It gives credit to those who went before. Honoring the early founders and utilizing all that was learned from that is still the foundation of this movement. But honoring does not excuse an art form from getting hackneyed and complacent. The solution was to secede from just those forms that had become stale by repetition; that is the part of Studio Glass we are pulling away from. In many ways, Glass Secessionism is putting glass back on the path it should have followed. 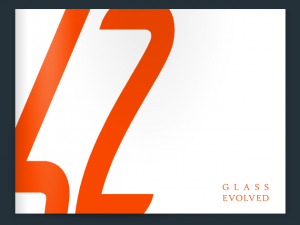 It encourages those areas of glass that had progressed over time and build heavily upon them. It reveres those artists who advance the medium, taking chances with new directions. In other words, we are not destroying the past, we are constructing a future.